The Camera app on your Android phone features three flash settings. 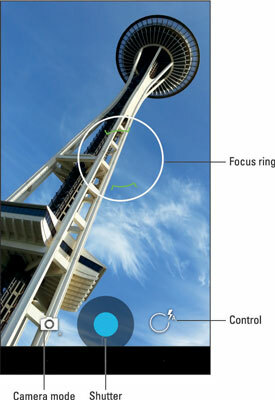 The current setting is shown on the Control icon (refer to the figure, where the setting is Auto flash). Not every Camera app features a Control icon. If your phone’s Camera app lacks such an icon, look for an icon representing the flash setting, similar to the one shown here. Touch that icon to set the flash. On other phones, touch the Menu icon to look for a flash setting command. After touching the Control or Flash Setting icon, the flash mode is displayed. Three options are available: flash off, auto flash, and flash on. In the stock Android Camera app, the flash mode you choose is reflected on the Control icon. 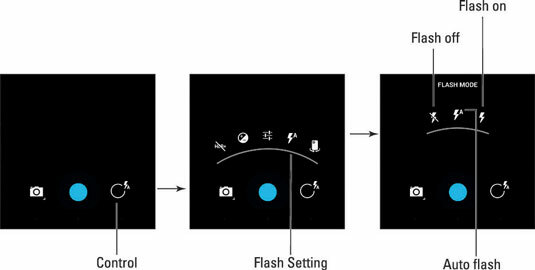 While the methods for setting the flash may vary, the icons shown in the middle of the figure are common for the standard flash settings: off, auto, and on. The auto flash mode turns on the phone’s flash in low-light situations, not when it’s bright. When the flash mode is set on, the flash always activates. When the flash mode is off, the flash never activates, not even in low-light situations. A good time to turn on the flash is when taking pictures of people or objects in front of something bright, such as Aunt Betty holding her prized peach cobbler in front of an exploding volcano. A so-called flash setting is available also for shooting video in low-light situations. In that case, the flash LED is on the entire time the video is being shot. This setting is made similarly to setting the flash, although the options are only on and off. It must be set before you shoot video and, yes, it uses a lot of battery power.